Mr Funnel fuel filters are a fantastic innovation for safely pouring fuel into your fuel tank and filtering our debris or dirt at the same time. In addition to this important task it will also separate any water form fuel – this is incredibly important for petrol engines but particularly diesel engines. 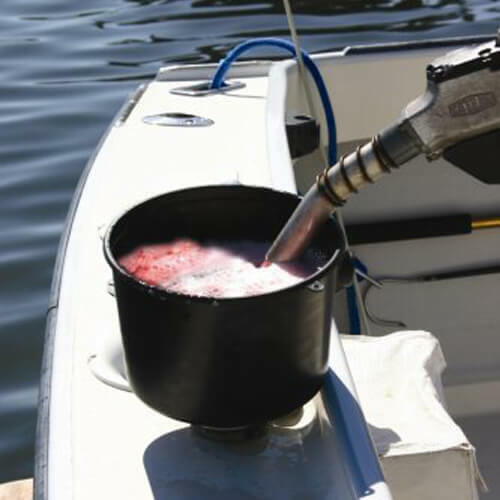 Keeping fuel clean in your boat or tender is one of the most important aspects of maintenance and housekeeping, ensuring you put clean fuel in the tank in the first place is just as important on your boat as ensuring your engines have pre filters and engine filters fitted and that they are clean too. Fuel related problems on boats are one of the most common causes for the RNLI being called out to help stricken boats, but also engineers frequently are attending to damaged engines and injectors or carburettors as a result of water contamination or debris in fuel. These funnels couldn’t be easier to use – simply choose the correct size for the use you need and the filter does the rest. Being Teflon coated filter screen – when you have finished filtering your fuel – simply turn the filter upside down and tap the rim, all fuel and filtered water will drop out. Please ensure you do this over a suitable container as there may also be remnants of fuel left in it too. If you rely on clean fuel – for sea going trips or for aviators in aircraft – then you would need some confidence and check the filter – certainly each season. You can do this by simply adding some sand to water and pour into the funnel and filter – none of this should pass through and all of it should be able to be tapped out after. No spare parts are ever required. If you have a large fuel tank – for example 50 gallons or more, you would be correct in saying this filter will slow you down considerably. But you can still use it – we suggest that you use it for the first 30 litres or so, check the filter for water and debris and if it is all clean then carry on filling your tanks direct form the pump. You could always stop at the halfway mark and perform another quick check. Doing this will give you confidence but more importantly another 10 minutes on the fuel pontoon is better than several hours at sea waiting to be rescued.